Cell Phones for Kids - Keep Your Kids Safe With A Prepaid Wireless Phone! Cell Phones For Kids - Keep Your Kids Safe! Kajeet is really the ONLY wireless provider that exclusively specializes in cell phones for kids! I can remember the days when only rich, corporate types had cell phones in their cars, and then there was the true mobile phone that required you to sling a huge battery pack over your shoulder. Well, technology and society has evolved dramatically, and now cell phones are part of our daily lives. Our children are now exposed to cell phones at a very early age, and keeping them from access would not only be nearly impossible, but not wise. In recent years it has become an important question regarding how young is too young to have your own cell phone? Should parents even be thinking about cell phones for kids? As the market has become more and more saturated, targeting youth has received even more attention, and you'll see a lot of "young" brands out there. As a parent, the idea of cell phones for kids is a double-edged sword. On the one hand, it provides a sense of security that our kids can be reached anytime, so we don't have to ever wonder where they are and whether they're safe. However, on the other hand, it leaves kids open to communicating with people that could be considered inappropriate or dangerous, inappropriate content online, and can be a distraction in school. Fortunately, Kajeet was founded in 2003 by three fathers looking for the right solution for their kids. The company has dedicated all of their energy and resources towards catering to the needs of parents by specifically providing cell phones for kids. Kajeet offers a number of features that cannot be found anywhere else in a meaningful way. If you're a parent, Kajeet is a service that you'll definitely want to consider! If you're not a parent, but know someone who is, once you read about the amazing, thoughtful, kid-safe features, you'll no doubt feel compelled to send this information to them. 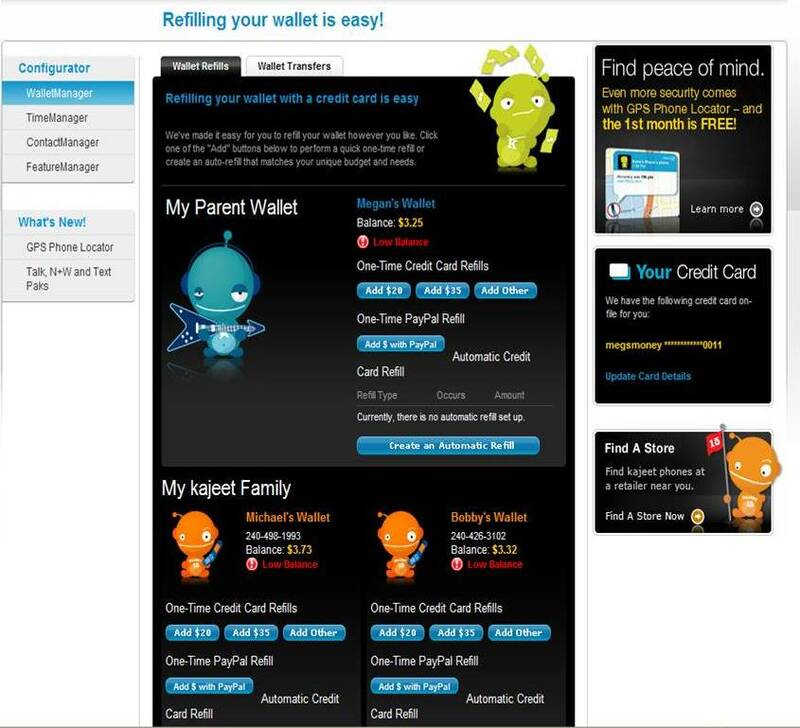 The Wallet Manager allows parents to decide who pays for what. If a parent puts $20 to spend in their child's wallet to last for the month, it's possible that he will choose to use the money within a week. Does that mean that the parent won't be able to reach their child? No! If the parent has money in the "parental" side of the wallet, they're still able call their child. With a typical prepaid service, when the phone's balance reaches zero, it cannot be used (except to call 911), and the parent is left in the dark. Conversely, with a postpaid plan, the parent can always reach them, but runs the risk of overage charges. The Wallet Manager teaches your child to use their wallet allowance responsibly, with the reassurance that you'll always be able to contact them. Click the image on the left to see an enlarged view of Wallet Manager. 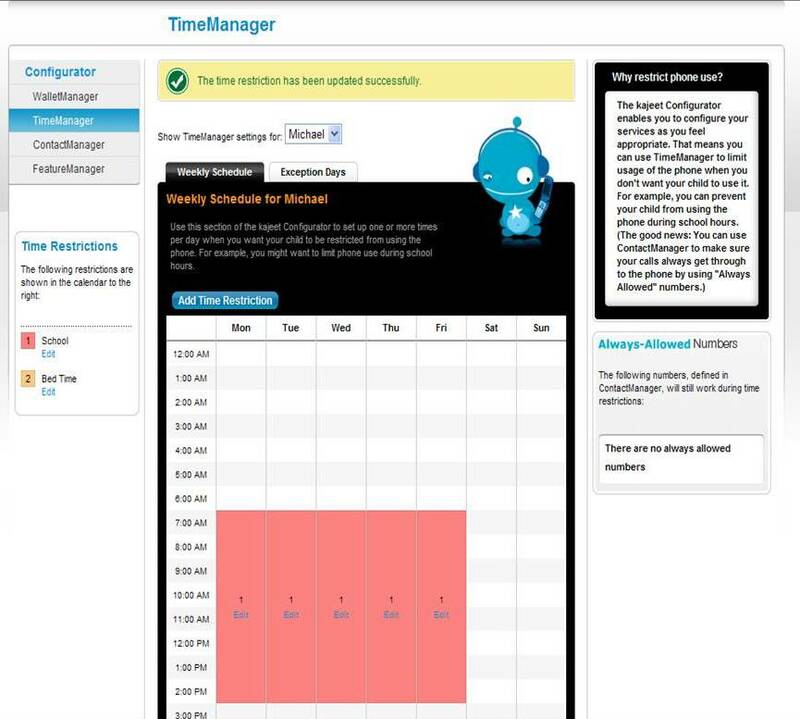 The Time Manager allows parents to decide when the phone can and can not be used. As the parent, we have the control to turn off incoming and outgoing calls as we deem appropriate. For example, we can restrict calls during school hours, while allowing for emergency numbers to still be accessible. That way we don't have to worry about inappropriate calling during school hours, but feel confident that in case of an emergency they can call 911 or call us for help. Click the image on the left to see an enlarged view of Time Manager. Contact Manager allows parents to program specific numbers that they want blocked to and/or from our child’s phone. Calls, text messages, and picture messages are all blocked. So if you're told that someone is calling your child and harassing them from a certain number, you can easily block that number. Conversely, you can also "block all" and allow access only to certain numbers. Blocked numbers will go straight to voicemail. 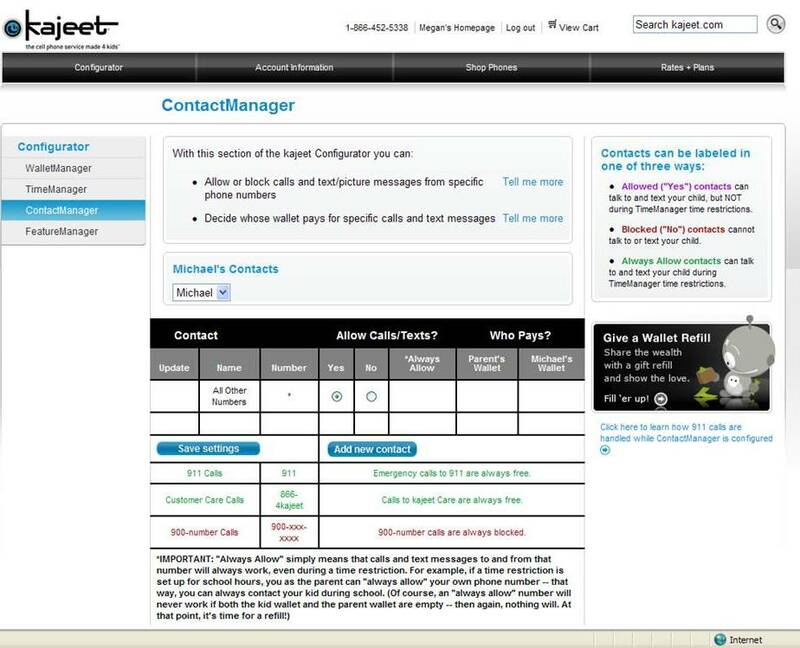 Click the image on the left to see an enlarged view of Contact Manager. 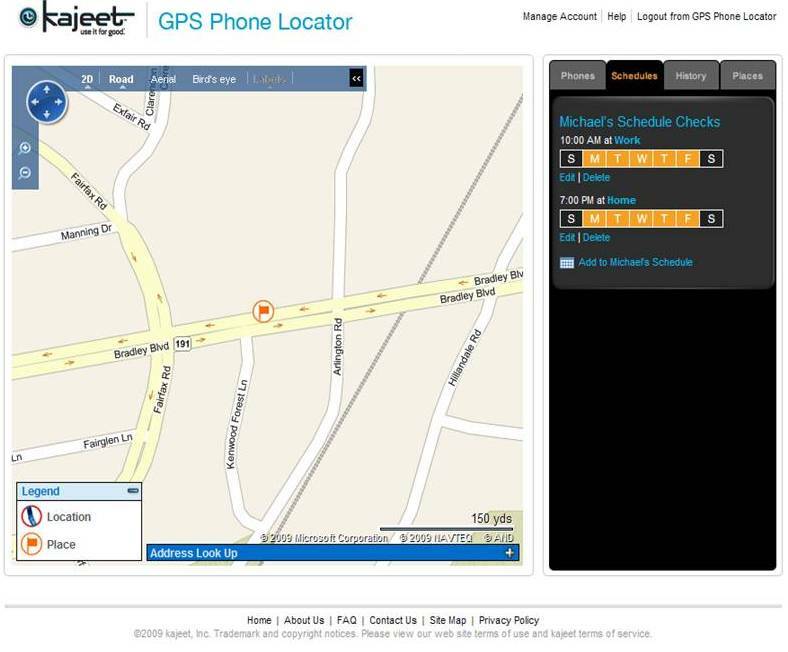 GPS Phone Locator allows parents to locate the phone/child. So if our child misplaces their phone, we can locate it using the Internet-based GPS Phone Locator. We can also set alerts through GPS Phone Locator. For example, if our child should be at basketball practice, we can set alerts to make sure they're actually there. Alerts can be sent via email to directly to the phone. Used appropriately, without abusing people's privacy, this is a great tool for parents to locate the phone and or child. Click the image on the left to see an enlarged view of the GPS Phone Locator. Please note that there are a number of Android and iOS applications now available that offer similar features that are also worth also exploring. View the video below of a kajeet parental controls demo. Cell phones for kids is definitely a topic that's starting to heat up; check out these special features! After reviewing the parental control features above, are you convinced that kajeet really is a unique offering targeting cell phones for kids? Feel free to visit Kajeet's website if you'd like to learn more, or place an order to try out their service. Note that starting in 2016, Kajeet no longer sells phones directly to customers, as they have moved to a Bring Your Own Device model. Thus, any Sprint phone can be activated on a Kajeet plan. LEARN ABOUT Broadband for Students!